After a lackluster year at the box office in 2015, Warner Bros. is hoping to rebound in a big way, with the help of two superhero movies, Batman v Superman: Dawn of Justice (March 25) and Suicide Squad (August 5). Later this month, the second Suicide Squad trailer will debut during The CW Network special DC Films Presents: Dawn of the Justice League, airing Tuesday, January 19 at 9:30 PM ET. 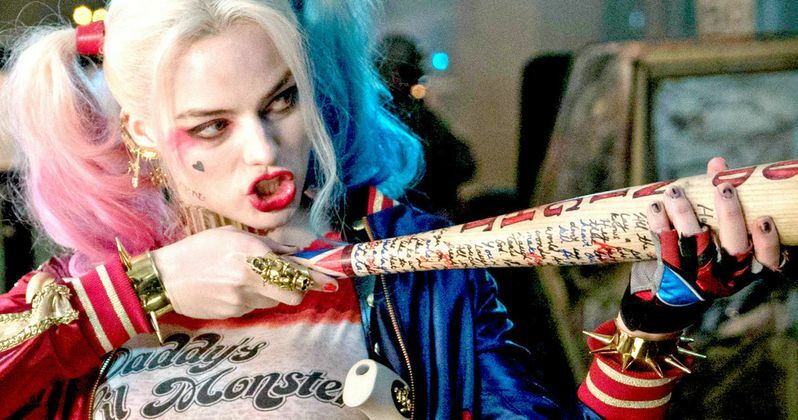 While we wait for that footage to surface, Suicide Squad star Margot Robbie offered some new details about her Harley Quinn character, in an interview with Cineplex. "Harley is creepy, violent, crazy - all of the things that I aspire to be! No. It's the fun of living vicariously through someone who is doing things that I would never do in real life." Margot Robbie will be joined by a stellar cast in Suicide Squad, including Cara Delevingne (Enchantress), Jai Courtney (Boomerang), Jared Leto (The Joker), Joel Kinnaman (Rick Flagg) and Viola Davis (Amanada Waller). The project also reunites the actress with her Focus co-star Will Smith. Here's what she had to say about how excited she was upon learning that Will Smith was in talks to play Deadshot. "I enjoyed working with Will so, so much that I was overjoyed when I heard that we would be working together again. I actually texted him when I heard he was in negotiations to be in Suicide Squad and kept peer-pressuring him, 'You'd better be taking this movie!' He obviously signed on for his own reasons, but I was so incredibly happy that we got to do Round Two. He's awesome on set and awesome off set. He's just a really, really good person." The supporting cast of Suicide Squad also includes Scott Eastwood, Adewale Akinnuoye-Agbaje and Adam Beach, with Ben Affleck also set to reprise his Batman v Superman role as The Dark Knight. David Ayer is directing Suicide Squad from his own script. What do you think about these new Suicide Squad details? Chime in with your thoughts, and stay tuned for the second trailer.